Congrats on the great time! I want to run a half marathon, but finding time to train for it is tough! PS I clicked on your sidebar wedding picture to get a bigger look and I am jealous you were featured on Martha's site! How wonderful for the both of you! And the wedding was beautiful; all the little touches were spectacular. How wonderful to have had a friend all your life. My best friend and I didn't meet until we were five. That's fantastic! 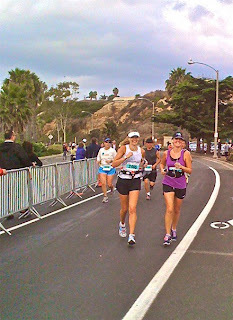 The race, the friendship (like a sister! ), and your gratitude for all of it. Inspiring, warm, and wonderful. Welcome back to the East Coast...we've missed you. Good job! I'm running but yet to have a desire to run a half marathon. Maybe I will some day. It's wonderful when you can share something like that with someone and have a friendship that lasts so long. LOVE YOU TOO! That was so much fun. Miss you. OK one more comment now that I can see the keyboard as my tears have passed. You are the best friend a girl could have I couldn't feel lucky or more grateful to have you in my life....the only reason I smiled the entire race and was so happy telling your mom that it was fun, was because I ran it with you- finishing holding hands might seem corny but it was one for my memory basket. I love you with all my heart! Can't wait for the next one. You guys are "two" cute! Pardon for posting so late to this, but I just found your blog today. I am a Cali native as well who has been transported to the distant lands of the Pacific NW. Running here is tricky with all the rain but if I stop for the the rain, I will NEVER get outside. 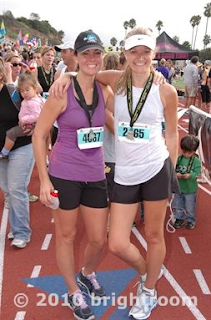 My wife loves that I drag her out with me :P Where was this 1/2 Marathon you ran? Keep on bloggin'!